To Cite: Moini M, Pahlevan-Sabagh M, Dehghani S M. Acute Liver Failure, Etiology, and Outcome: An Experience in a Referral Liver Transplant Center, Hepat Mon. 2017 ; 17(6):e14086. doi: 10.5812/hepatmon.14086. Background and Aims: Acute liver failure (ALF) caused by a sudden loss of liver function in patients without pre-existing liver disease is a rare condition and one of the emergencies in the field of hepatology. The common etiologies of ALF vary in different geographic areas and the course is highly variable among patients with different confounding factors. In this prospective study, ALF patients referred to our tertiary center were followed, and their data were analyzed for determinants of outcome. Methods: From March 2014 through February 2015, all adult and pediatric patients with a diagnosis of ALF, who were admitted to the gastroenterology and hepatology wards of our center with a large liver transplant program, were included in the study. Survivors were followed for at least 3 months after discharge from the hospital. Results: A total number of 45 (23 males) patients were included in the present study. 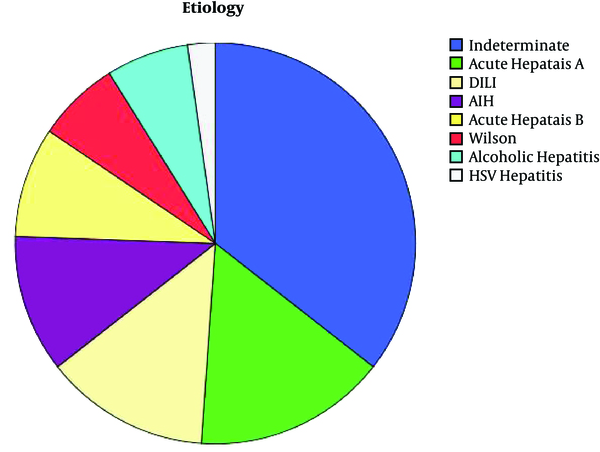 The most common etiology was acute hepatitis A (15.6%), followed by drug induced liver injury (13.3%), and autoimmune hepatitis (11.1%), while most cases were classified as indeterminate ALF (35.6%). Overall survival rate was 71 %; 24.4% (11 patients) died, 46.7% (21 patients) survived without transplant, and 28.9% (13 patients) were transplanted, but 2 of them did not survive. Conclusions: Most cases of ALF in this study had unknown etiology. Acute hepatitis A was the most commonly identified cause. About half of the cases survived without transplantation with very good outcomes after 3 months, one-third received liver transplantation with excellent post-transplant survival. Previously known as fulminant hepatic failure, acute liver failure (ALF) is an emergent condition in the field of hepatology, which is defined as the rapid onset of liver dysfunction characterized by mental deterioration and coagulopathy in a patient without pre-existing liver disease (1, 2). The definition was further revised according to the time interval between the onset of jaundice and development of encephalopathy. The new terminology subdivided ALF into hyperacute, acute, and subacute liver failure, with a potential benefit to better predict the prognosis and devise a management plan (3). Acute liver failure is a rare condition with an incidence rate of about 1 to 8 per million population annually (4). The incidence rate may be higher in areas with higher rates of viral hepatitis (1, 3). There is a wide spectrum of etiologies, which could potentially result in ALF including viruses, drugs, autoimmune, and metabolic causes. However, the etiology in a large number of cases remains undefined. The common etiologies of ALF also vary geographically and by time. The most common cause is drug induced liver injury (DILI), especially acetaminophen overdose, in developed countries such as the United States (5), but viral hepatitis predominates as the cause in developing countries (6, 7). However, this overall trend cannot be extended to all areas and all times. In the present study, the etiology and outcome of all adult and children cases of ALF were prospectively studied. These were referred cases to a hospital affiliated to Shiraz University of Medical Sciences in Iran, with the largest liver transplant program within 12 months. During a period of 12 months starting from March 2014, adult and pediatric patients with a diagnosis of ALF, who referred to Nemazi hospital gastroenterology and hepatology services were prospectively included in this study. Nemazi hospital is an academic center affiliated to Shiraz University of Medical Sciences, having the largest liver transplant program in Iran, with a high volume of annual liver transplantation, as high as 500 annual transplants. The center accepts patients with acute or chronic liver disease from all provinces in the country. Acute liver failure was defined as prolongation of international normalized ratio (INR) to 1.5 and over and any degree of altered mental status (hepatic encephalopathy) resulting from an acute liver illness of less than 26 weeks duration in a patient without pre-existing liver disease. In the pediatric group, encephalopathy was not regarded as an essential component of diagnosis in a patient with an INR ≥ 2 not corrected by administration of vitamin K (8). Patients who had evidence of previous chronic liver disease were excluded from the study. According to our liver transplant center policy, all patients with the diagnosis of ALF are listed to receive liver transplantation and are given the highest priority in the absence of any contraindication. Severe comorbidity, uncontrolled infections, or sepsis and uncured extrahepatic malignancies are among the contraindications for liver transplantation. Advanced age (> 65 yrs.) is considered as a relative contraindication, which requires case by case decision. This study was approved by the ethic committee of Shiraz University of Medical Sciences. Informed consent was obtained from the patients, their guardians, or their next-of-kin for taking part in the study. A questionnaire was given to every patient, and they were followed by the hepatology and transplant team during hospitalization, with recorded data kept in a flow chart. The medical history was thoroughly evaluated by adult or pediatric hepatology services. Any history of previous chemical or herbal drug, alcohol consumption, or toxin exposure was recorded. Histories of any past or recent liver diseases in the family, ill contacts, drug injection, tattooing, sexual contacts, and any recent travels were obtained. Extensive evaluations were done to diagnose the etiology of liver disease. Viral hepatitis was diagnosed with positive serology test or molecular assessment, which included HAV IgM antibody for hepatitis A, HBS antigen or HBc IgM antibody for hepatitis B, HCV antibody for hepatitis C, HEV antibody for hepatitis E, serum molecular tests for Cytomegal virus, and Ebstein Barr virus. Herpes simplex virus hepatitis was diagnosed by performing molecular test for the mentioned virus on liver tissue. Autoimmune hepatitis (AIH) diagnosis was based on the criteria defined by the autoimmune hepatitis foundation group (9). Wilson disease was diagnosed based on ceruloplasmin level < 20 mg/dL and urine copper level > 100 μg/24 hr. Additional data including positive family history of Wilson disease and ratio of alkaline phosphatase to total bilirubin < 4 and AST: ALT > 2.2 were also used according to Korman et al. to help achieve a more accurate diagnosis (10). Alcoholic hepatitis was diagnosed according to the patient’s history of heavy alcohol drinking. The cause of ALF was considered indeterminate when all investigations for the cause of liver disease were inconclusive. Data from the time of admission for each patient were used for analysis. Statistical analysis: statistical calculations were performed using Statistical package for social sciences (SPSS, IBM corp., Armonk, N.Y., USA) Version 19. Student t tests and χ2 tests were used to compare numerical and categorical variables. Nonparametric Mann-Whitney test was used to compare means of age, serum creatinine, serum bilirubin, INR, and encephalopathy grade between groups. One-way ANOVA test was used to compare means of normally distributed variables between all 3 groups of patients; and for variables with non-normal distribution, Kruskal-Wallis test was performed. A P value of < 0.05 was considered significant. During the study time, 52 patients were admitted to Nemazi hospital with a possible diagnosis of ALF. Careful evaluation revealed an evidence for chronic liver disease in 7 patients, and they were excluded from the study. Of 45 study patients (23 males), 7 were in pediatric age groups. Overall mortality rate was 24.4%, transplant free survival rate was 46.7%, and transplantation rate was 28.9%. Of 13 transplanted patients, 1 died on the first post-transplant day due to cardiopulmonary arrest, and the second patient developed primary organ nonfunction and did not survive despite receiving a second liver transplant, but the other 11 patients were discharged in good health. Data for each group of patients are demonstrated in Table 1. Abbreviation: INR, internatinal normalized ratio. aValues are expressed as No. (%), mean ± standars deviation (SD) or median, lower quartile (Q1) and upper quartile (Q3), depending on normality of distribution. bTime to event is calculated from the first day of hospital admission to the day of outcome (discharge, death or transplant). The most common known cause of ALF was hepatitis A (15.6%), followed by DILI (13.3%), and AIH (11.1%), however, most of the cases had undetermined etiologies (Figure 1). None of the cases of DILI was due to acetaminophen overdose. Herbal drug induced hepatitis was diagnosed in 2 cases who had a history of using some sort of herbal remedies that were not available to us for further investigation. None of our patients showed a positive serology for hepatitis E.
Patients who survived without transplant were not significantly different in mean age from those who received liver transplantation, or those who died (P = 0.366, and P = 0.156, respectively). Patients who did not survive were older, but there was no significant statistical difference in the mean age, when all 3 groups were compared. Gender distribution did not reveal any significant difference between groups. The highest transplant free survival rate was observed among patients with acute hepatitis A (85.7%). By comparing the patients who did not survive with those who did survive without transplant, we found that the mean total serum bilirubin and INR were not significantly different, but the grade of encephalopathy was significantly different between the 2 groups (P < 0.001). When encephalopathy grade was categorized into mild (grade I and II) and severe (grade III and IV), there was a significant difference between the 2 groups, with more severe encephalopathy in those who did not survive (P < 0.001). Grade IV encephalopathy was present in 72.7% of the patients who did not survive without transplant, but there were no cases of encephalopathy grade IV in patients who survived without transplant (all had grade III or less). Mean serum creatinine level was observed to be higher in the spontaneous remission group, but with no statistical significance (P = 0.051). This higher mean level was due to a case with acute kidney injury and creatinine level of 10.3 mg/dL at the time of admission who recovered after hemodialysis and receiving supportive care. In patients who received liver transplantation, INR level was significantly higher than those who did survive without transplantation (P = 0.007), but no significant difference was observed when compared to those who did not survive (P = 0.424). The mean time to event (death, discharge, or transplantation), calculated from the first day of hospital admission, was not different statistically when all 3 groups were compared (P = 0.105). However, the mean time to event in the deceased group was significantly shorter compared to those who survived without transplantation when these 2 groups were compared (P = 0.027). The main reasons for not receiving liver transplantation in patients listed for transplant were unavailability of the appropriate donor/organ and removal from the list because of being too ill, superimposed uncontrolled infections, severe comorbidity, or improved condition. The number of pediatric patients was too low to be analyzed separately. However, there was only 1 death in the pediatric group in a patient with indeterminate etiology. Three had spontaneous remissions, and 3 underwent liver transplantation. Patients with remission without transplant and those who received liver transplantation were followed for 3 months after hospital discharge. They were all alive and in good general condition. All discharged transplanted patients were alive and in good condition 12 months posttransplant, with 3 months, 6 months, and 1 year survival rates of 84.6%. The syndrome of ALF is a nonhomogeneous entity with variable epidemiology, resulting from a wide spectrum of etiologies and with diverse courses and outcomes. The etiology of ALF is an important determinant of outcome, and thus, every best effort should be made to determine the causative factor to guide proper management and better outcome of disease. Among different etiologies, ALF resulting from acetaminophen overdose has been found to have a more severe clinical condition with higher coma grades and higher rate of mortality in patients listed for liver transplantation (11). Acetaminophen overdose is the leading cause of ALF in the United States and has remained the dominant etiology over time (12, 13). It also accounts for most cases of ALF in many developed Western countries such as the United Kingdom and Nordic countries (14, 15). However, the dominant etiology of ALF is not similar even among Western countries due to its highly variable epidemiologic pattern. In a study conducted by Gulmez et al. it was found that acute drug overdose, mainly from acetaminophen, was the etiology for ALF in 20% of the causes in 7 European countries overall, but with a very variable range of prevalence from 1% in Italy to 52% in Ireland (16). In another study by Escorsell et al. the incidence of acetaminophen induced ALF was reported to be very low (2.2%) in Spain (17). In the present study, acetaminophen overdose was not recognized as the cause of ALF in any of our patients. All cases of DILI were due to nonsteroid anti-inflammatory drugs (NSAIDs), or herbal medications. Analysis of the reasons for this observation needs a separate epidemiologic study, and thus, is beyond the scope of this manuscript. However, some points could be considered. Acetaminophen is an over the counter medicine in Iran and is easily accessible. Available tablets are in the maximum dose of 500 mg per tablet alone or in combination with other drugs. There are reports of considerable rates of acetaminophen poisoning among patients with drug poisoning admitted in medical centers in Iran (18). Nonetheless, the rate is not as high as it is in Western countries. Due to the availability of an effective antidote treatment, it is also possible that most cases of confirmed acetaminophen overdose received appropriate treatment before significant adverse effects occur. The other point is that our study was not population based and was conducted in a single tertiary center, so the rapid course of acetaminophen induced ALF (when it develops) might had led to development of a terminal outcome and death in some patients before referral or arrival at our center. Growing interest toward alternative and traditional medicine and increasing the frequency of improper self-medication practice, especially for herbal remedies, have raised concerns about the resultant side effects, particularly hepatoxocity. In the present study, we had 2 cases of DILI related to self-medicated herbal substances that led to death in 1. As a matter of great importance, further studies should be conducted in this regard. Hepatitis A was the most common known etiology of ALF in our study, and all the cases occurred in adult patients (15.5% in total and 24.1% among known causes). This high rate of HAV- induced ALF is not a usual finding in other parts of the world. In a study from Spain, viral hepatitis from acute hepatitis B is recognized as the most common cause of ALF, accounting for 37% of the cases (17). Acute hepatitis E has been reported as the most common cause of ALF in India by Khuroo et al. with a high incidence rate in pregnant patients. In the same study, the rate of acute hepatitis A was shown to be low (7). By contrast, a high rate of acute hepatitis A, as the cause of ALF, was reported in pediatric patients from Chile (19). This is different from our study finding that none of the cases of acute hepatitis A occurred in pediatric ALF patients. In our country, vaccination for hepatitis A is not part of the immunization schedule. Our finding of high rate of acute hepatitis A among adult patients with ALF may point to the need for further epidemiologic studies to develop new preventive policies for this disease. In our study, AIH ranked as the third known etiology for ALF, with a rate of 11.1%. It is hypothesized that a considerable proportion of ALF cases with indeterminate etiology have autoimmune pathology. In a study done by Stravitz et al. 58% of the patients with indeterminate ALF from the United States were diagnosed with probable AIH (20). Reports from Japan have also shown that the rate of indeterminate etiology for ALF (about 40% in a national survey in the past) decreased with the precise diagnosis of AIH (to 12% in a more recent data from a single unit) (21, 22). Thus, the diagnosis of AIH should be considered in any case of ALF even when there is not a classical clinical presentation (23). Considering the high prevalence of indeterminate etiology ALF among our patients, the real prevalence of autoimmune ALF (AI-ALF) could probably be much higher, exceeding acute hepatitis A as the most common cause of ALF. From unpublished data from our center, we have also noticed a considerable increase in the number of AIH cases as the cause of end stage liver disease requiring liver transplantation in the recent years. Far behind potentially preventable liver diseases such as viral hepatitis and acetaminophen overdose, autoimmune liver disease, specifically in the acute form of presentation, does not seem to be preventable. However, early diagnosis and appropriate management could be life saving for at least a considerable proportion of patients and could decrease the need for liver transplantation. The diagnosis of AIH in the setting of ALF is more challenging, and many of the cases have atypical clinicopathologic presentations (24). The findings from the study by Stravitz et al. pointed to the important role of histopathology of liver in the diagnosis of AI-ALF. They proposed that 4 liver histologic findings could be interpreted as probable AL-ALF and suggested the centrilobular necroinflammatory features as the hallmark of the disease. They also asserted that the addition of positive autoimmune seromarkers to histologic findings would strengthen autoimmune phenotype diagnosis (20). However, percutaneous liver biopsy may not be a feasible diagnostic approach in the setting of ALF, with coagulopathy and an unstable patient condition. Transjugular route of biopsy taking although much safer, has its own limitations as it requires special expertise and may not be possible to be performed in every center. It has been suggested that characteristic imaging findings could be of value in diagnosis of AI-ALF. In their study, Yasui et al. have described the pattern of heterogeneous hypoattenuicity on unenhanced CT scan as the characteristic CT finding for diagnosis of AI-ALF (25). The patient outcomes for ALF in the present study were good with 46.7% survival, and a transplantation rate of 28.9%, comparable with the results reported from other studies (11, 26). We also had a good post-transplant survival rate of 84.6% for 1 year. As mentioned earlier, the best outcome was observed among patients with acute hepatitis A. In this study, as expected, worst outcomes were observed among patients with more severe encephalopathy at the time of admission, with a cumulative rate of mortality of 64.3% in grade III and IV versus 6.5% in grade I and II. Severity of encephalopathy was significantly higher in patients who did not survive compared with survival without transplant. Median of the time to event was shorter in patients who did not survive, emphasizing the need for more rapid action in patients with more severe disease. The median time to transplantation was 9 days in our study, which was considerably longer compared to similar reports (11, 17). The short time to event for death and the long time for transplantation are important points that should be taken into consideration to set up more rapid transplant processing in cases with ALF. Our study was a prospective survey and the first report on the outcome of ALF from the tertiary center with largest liver transplantation program in Iran. Limitations of our study included the limited number of included cases and the referral bias due to study design, which were addressed, as this was not a population-based study. In conclusion, we determined that most cases of ALF in our center were due to indeterminate etiologies. Our results revealed a different etiology pattern from other similar international reports, with a high rate of acute hepatitis A and AIH among ALF patients. Liver transplantation led to a good outcome for those who received it, moreover, a good short-term outcome was observed among patients who survived without transplantation and were discharged from the hospital. Future regional population-based studies are required for proper assessment of epidemiologic aspects of ALF in this specific area. We would like to thank Dr. Michael Schilsky, Medical Director of transplant hepatology, Yale New Haven transplantation center and member of acute liver failure study group, for his review and valuable comments on this manuscript.